The deets: Kelsi Dagger heels; Urban Outfitter sunnies; Express top; Piperlime clutch; H&M skirt; Headband c/o Andrea's Beau; Tiffany & Co. bracelets. Ever have one of those days where you want to look pretty and put together, but have seriously stubborn hair happening? A fabulous yet delicate headband was just the cure my second day hair needed to be tamed. I just had the absolute best time in NYC this past weekend with girlfriends but wanted to spend some date night time with my boy when I got back. After a long bus-ride in the heat and no time to re-wash it, it was just the thing I needed to pretty-up my locks before dinner. There are SO many cute styles available and the bra-strap adjustable band makes it a perfect fit (and stays in place, amen!). Check out their pieces here. If you like them on Facebook, you can also get 15% off (here), happy Monday! The heart bracelet is really, really pretty. And I love the bright pink nails! Love the detail on the sleeves on that top! I hate it when my hair has a mind of its own! But your hair and outfit look amazing. I love that top, so beautiful. You look so good with a headband. Loves it. Love the headband look on you!!!!! The headband looks perfect, and love this outfit - it almost looks like a dress! The headband matches so well with the lace on the top! Adorable! Love the headband!!! It's so pretty. I love that headband and the lace sleeves of your shirt! So summery! Your hair always looks gorgeous to me. Love that cute headband and the sleeves on your shirt! I love love this top you have on! Thanks for the link, ill check them out! Love your sweatshirt! The lace sleeves are awesome. Great headband! I have those hair days way too often...and a piece like that is perfect! Cute look! Love the subtle color blocking effect! I am love with the casual grey part of your shirt mixed with the feminine lace, so pretty! Your whole outfit is adorable & I think you hair looks GREAT! Will definitely have to check out that company for my own wild hair days! I adore the entire look! Adorable!! A headband that stays in place is like a gift from God. gorgeous! i love this outfit - it feels so relaxed yet glamorous! Love the crochet details! And the pink shorts in your previous outfit shot is one of my favs :) shorts and heels - my summer go to. You look adorable !! Loving the whole outfit to bits , especially the heels ! Following you now - i would love to have you among my followers , too ! Great outfit! Is that an old or newer Express top? I really like it! Love the skirt too! i might try this! i hope i can pull it off though :) very cute! i love headbands and that one is seriously adorable! You look SO cute with your hair like that! I love the top too! Don't you just look adorable?! I love the outfit and love the headband. 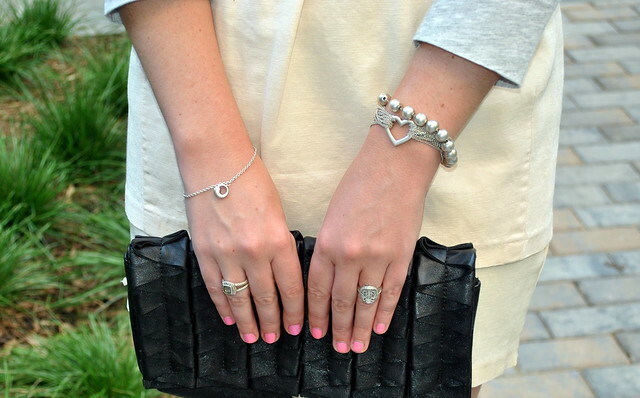 Super cute look for a date night! You look so stinking cute!! I absolutely love this look. I love the headband! It looks great on you. What stubborn 2nd day hair? It's perfect! I wish my hair looked that fab on the 2nd day!! You look gorgeous and loving that lace band! I need to check out their stuff! Happy week and happy 4th!! We love the headband and your nail color is amazing! So pretty! Love you skirt! Really love your shirt! It's different- I haven't seen one where the lace is just one the sleeves like that! 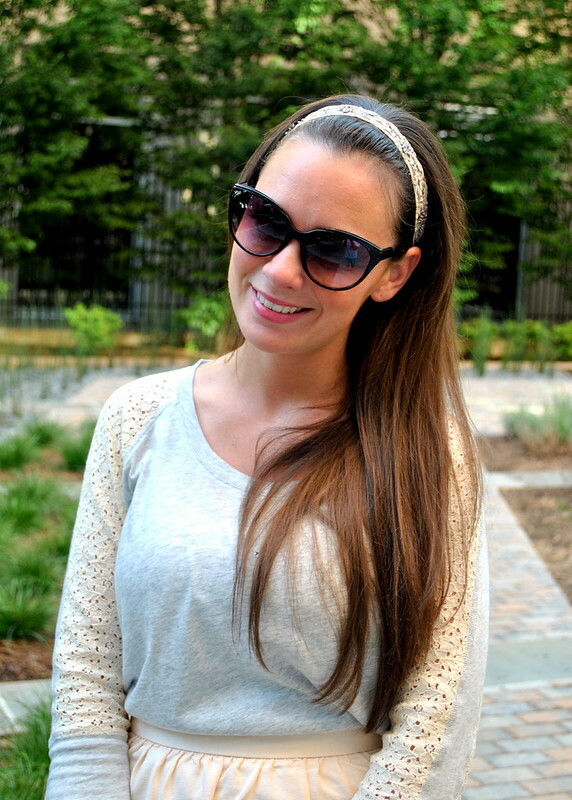 I do like the way you paired it with a neutral skirt and pretty headband- it's a great casual chic look! I would love for you to visit my blog sometime!! Great top! Casual but girly! Your hair looks awesome pulled back with a band! Your hair always looks amazing. But I especially like it like this- a bit teased (or maybe you just have fabulous volume and in which case I am even more jealous of your hair), in a head band and pin straight. Love it! Good idea to use a headband that one is super cute. I pull out the headband trick more often than I probably should. Always great to know about new headband resources. :) You look lovely and your hair looks even better!